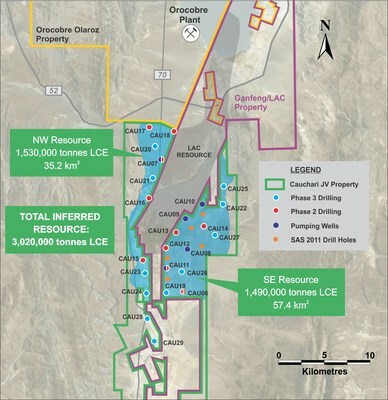 VANCOUVER, Jan. 31, 2019 /CNW/ - Advantage Lithium Corp. (the "Company" or "Advantage Lithium") (TSX Venture: AAL) (OTCQX: AVLIF) is pleased to provide this update on activities at the Cauchari JV property located in Jujuy Province, Argentina. President & CEO Mr. David Sidoo commented: "The CAU07 test results confirm the excellent characteristics of the NW Sector for future brine production, both in terms of high lithium concentration and positive aquifer and pumping characteristics. This area was first drilled by Advantage in 2017, having had no previous exploration. We are currently conducting an update of the project resource estimate with results from the recently completed drilling, concurrently with preliminary design of production well fields for the project Feasibility Study. Results to date suggest we have yet to fully define the extent of brine mineralisation, with the Cauchari-Olaroz basin emerging as the most significant lithium brine basin outside of Atacama. We look forward to providing further information to shareholders as activities progress."